Two weeks ago, right before the massive snow storm came to Michigan and Ohio, my family was invited to Castaway Bay in Ohio. 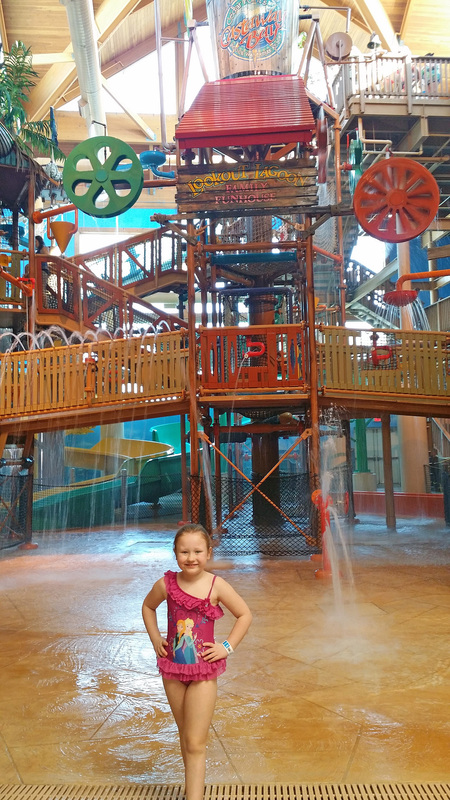 We were looking forward to experiencing a mini-family get-a-way, especially at an indoor water park where it is always 82 degrees despite the weather outside. It was a fun way to get over the winter blues. I packed our suits, snacks, and every stuffed toy my 7-year-old owns. We were on our way, even though the weatherman was predicting 8 to 12 inches on snow. What a GREAT time we had. Check-in was easy, and our room was perfect. I always appreciate rooms coming with a mini-fridge and microwave. My daughter is such a picky eater, we always need that luxury in our room, just in case! However, they do have a restaurant called Mango Mike’s which had a buffet with a variety of choices for both dinner and breakfast. Castaway Bay also offers an ice cream shop and snack shop. So basically there is food for everyone, including room service!! 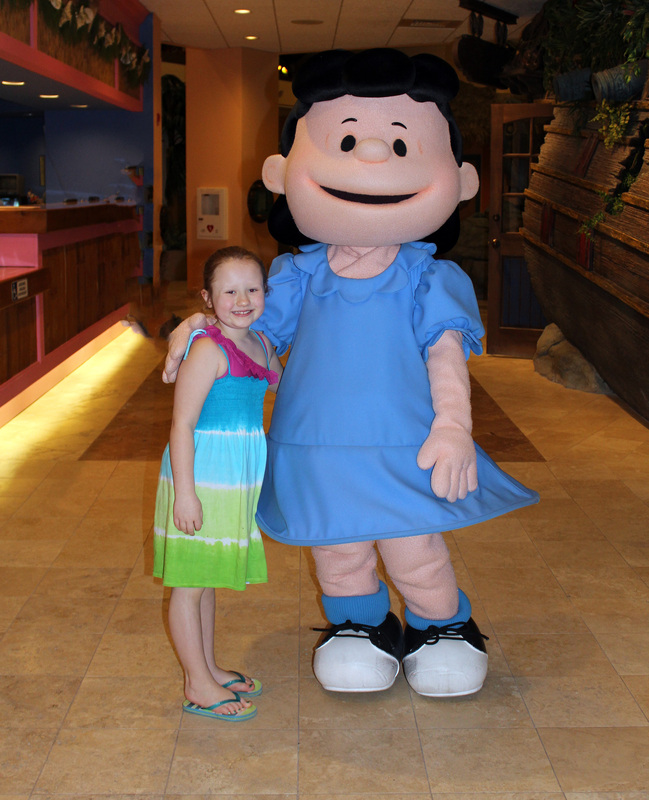 We were lucky enough to meet BOTH Snoopy & Lucy during our adventure there. Each morning, Castaway Bay creates a Daily Island Times Newsletter that is available to all guests and posted. This provides families with a quick itinerary for parents to reference to see the different activities they offer through the day/night. Activities include arts/crafts, meet/greets, and story times. The waterpark has a tropical, Caribbean theme with slides for all sizes, a fantastic wave pool, an indoor/outdoor whirlpool spa (which was our favorite) that is super warm, but very relaxing, and a family fun house which is an interactive play area with over 100 different elements to play in or with!! The park provides towels for you, and you can purchase snacks right there inside from Big Daddy’s Snack Shack. I can honestly tell you that we lost track of time because we had such a good time and it was time to close!!! 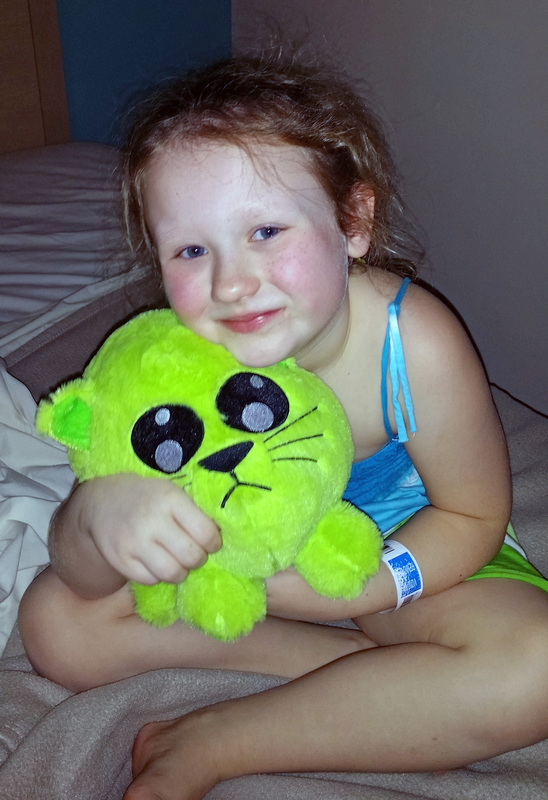 But never fear, we found the arcade to entertain us and get our daughter a special big-eyed kitty! Mom: What was your favorite part of the water park? Daughter: I liked that we got to go outside in the snow. It cooled me down. Mom: Would you go back? Mom: Anything else the readers need to know? Daughter: Make sure you check the height requirements because I was sad I couldn’t go into the one pool without a life jacket on. I know how to swim too!!! You can bring your own though. Also, as you know, Castaway Bay is affiliated with Cedar Point. We can’t wait for the weather to warm up so we can go back to Cedar Point. So, stay tuned for more information about what’s new at Cedar Point for 2019. 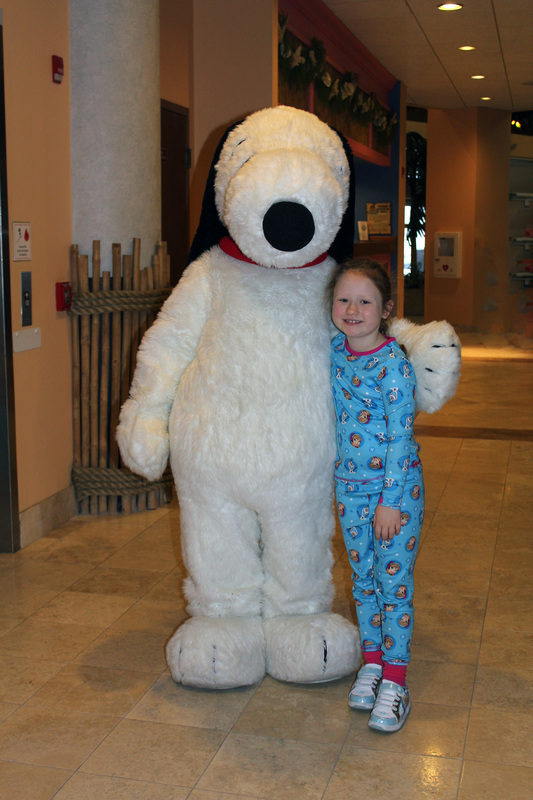 In the meantime, tag us in your fun Castaway photos this winter by using @DetroitMommies and #DetroitMommies. We can’t wait to see the fun you’re family is having at this awesome indoor waterpark. this would be a perfect getaway from winter! We are experiencing the winter blues and a trip to Castaway Bay would be just what the doctor ordered. 82 degrees sounds so good right about now. Plus it looks like a blast. This would be a great get away for my family. My 7, 4 and 2 year old would love to swim. It looks like a lot of fun too! Castaway Bay looks and sounds like a fun tropical getaway that is close enough to get away from the cold, frigid weather that Michigan has been dealt with this year. My daughter who is ten has worked hard in school and receives excellent grades by thriving to do her best, deserves to win so she can have a fun and relaxing mini vacation without having to worry about anything. The family fun house with water slide and a spa can make an adult feel like a kid again. We would love to win this getaway to experience the fun that this place has to offer!!!! With a new baby on the way, we want to take our son somewhere fun before she arrives! I need to win these tickets for a break from the 8 birthdays in my family between Feb 3 and March 3 (heck 1 is tomorrow). Three in my house. I’m exhausted from trying to make it all work. A warm family friendly place would be perfect for a mini-vacation! My kids would love it! I would love to win these tickets for my family. 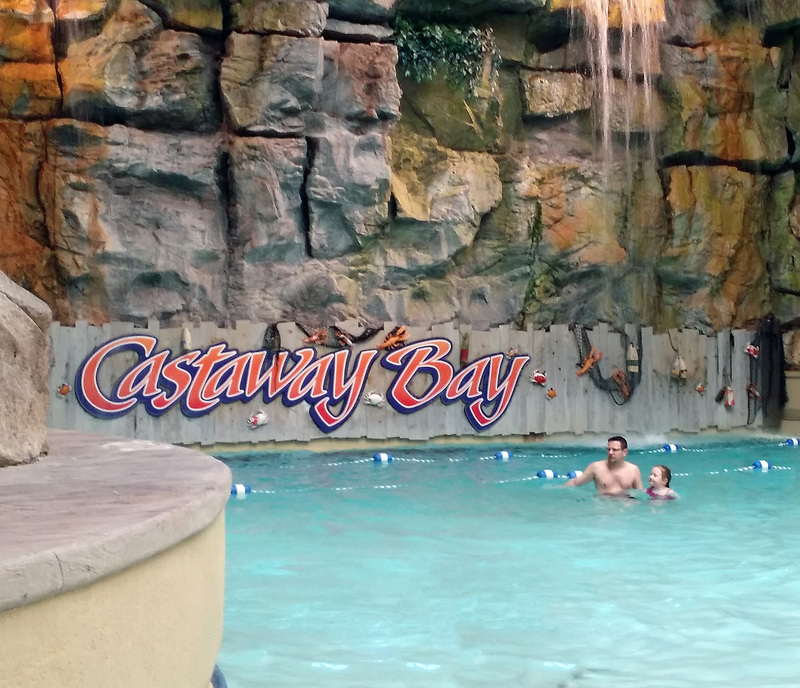 We are exhausted with the severe cold and could really use a break of the warmth and fun of Castaways Bay’s indoor water park! I need to get my kids and goddaughters outta this freezing cold dreariness and into something fun!!! HELPPPPPP!!!!! Our kids have been cooped up and off school for the past week. They need to run (and swim) off some energy. We could treat my son and his friends to a bday party trip to Castaway Bay in April!!! I would love to win as it would give me a reason to visit the area with my family:-). Being as we are from Southeast Texas and keep up with DetriotMommies.com. Thank you for the chance to win! My family has had a chance to getaway in about 3 years. My 91 year old Mom lives with us and she has been ill and needing constant care. This would be a great getaway for the family. Thanks for the chance to win. I am so tired of winter! I would love to take my grandkids! I would love to win this for my family, because with a baby on the way we must cut cost anywhere possible. This would make for a wonderful getaway for me and my sweetheart!! I need to win so I can surprise a dear friend who really needs a break!!! I don’t think I can afford a vacation for my family this year but winning this prize may put us on the road to a great summer, thanks for the chance to win! P.S. Great pics, looks like a lot of fun! Our family would be so blessed to receive something so incredible like this. As a stay at home mother the bitter cold temperatures here in Michigan have kept us from doing a whole lot of escaping from the house with our 2 yr old daughter. My husband works so hard to provide for us & we have been trying to plan a one night getaway (financially thats all we can afford) to our local waterpark (an hour away) But nonetheless something comes up every time. This wouldn’t only be for our daughter but us of course as we love adventures & we treasure every moment with our daughter. I know she would be beyond ecstatic to take her cousin to this amazing destination!!!! This momma would have her camera glue to her hand to capture all the fun!!!! I would love to have the opportunity to go away and spend some quality time with my kids! Life is so busy! We need a staycation!! My almost 8 year old and I are sick sick sick of the snow! We want to go have a day where we can pretend we don’t live in Ohio and it isn’t below 0° outside. I need to win these passes so i can get my husband and my girls out of this cold cold cold! It would be so fun to have mini “day vacation”! I am so excited to see that I won. I can’t wait to enjoy the warmth of the 82degree waterpark. As I told my daughter and husband The good news, my daughter asked me when do we leave??? Thank you again for the tickets and I can’t wait to experience the fun and excitement that Castaway Bay has to offer! What a fun mini vacation that is well deserved for my daughter.